FastFix sanding pad system, tool-less. Eccentric motion for high-quality, scratch-free surfaces. Sanding up to the edge thanks to the Festool PROTECTOR. Ideal ergonomic grip positions. ROTEX rotary motion for efficient material removal. Four tools in one: for coarse sanding, fine sanding, delta sanding and polishing. Resulting in low investment costs and savings on working time. Effortless work thanks to a weight <1.5 kg. 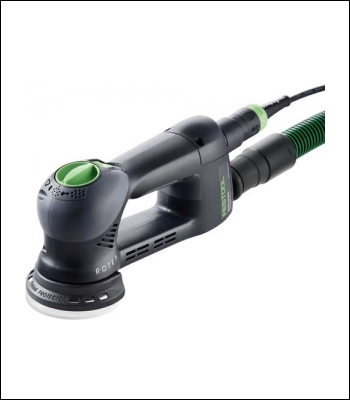 Ideal for vertical surfaces or overhead work. Sanding off paint and varnishes on window frames. Sanding feather-and-groove joints.